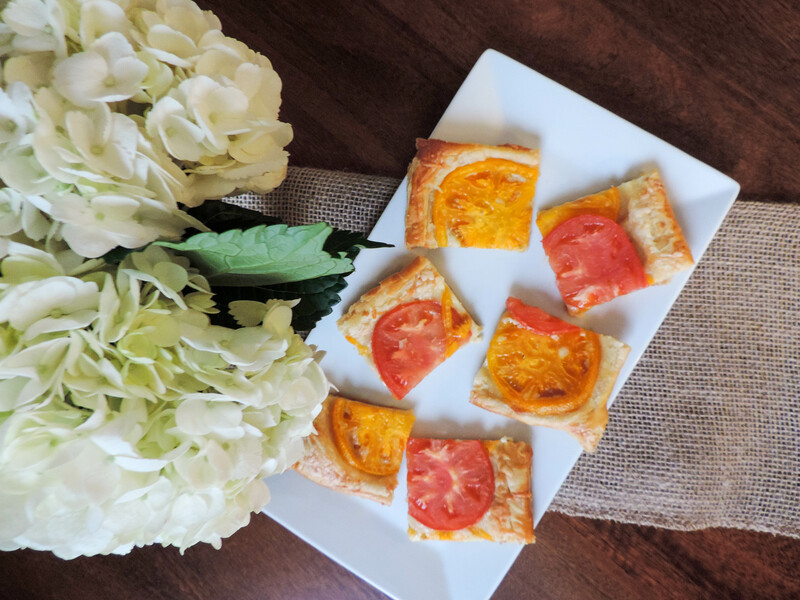 A delicious and beautiful appetizer that is perfect for those end of summer tomatoes and parties. I haven’t shared a recipe here in a while- probably because all the summer travel this past month brought my cooking to a bare minimum. I wish I could say September will be different, but we have a lot of fun trips and wedding weekends planned so we will be on the go again. One of the places I am most looking forward to visiting is Charleston! Have any of you been there? I’ve only heard great things and I am so excited to see this adorable Southern town for the first time! Okay, enough about my schedule (#boring)… let’s talk about this beautiful tart! Tomatoes are especially good in August and September so they are just begging to be added to your meals. 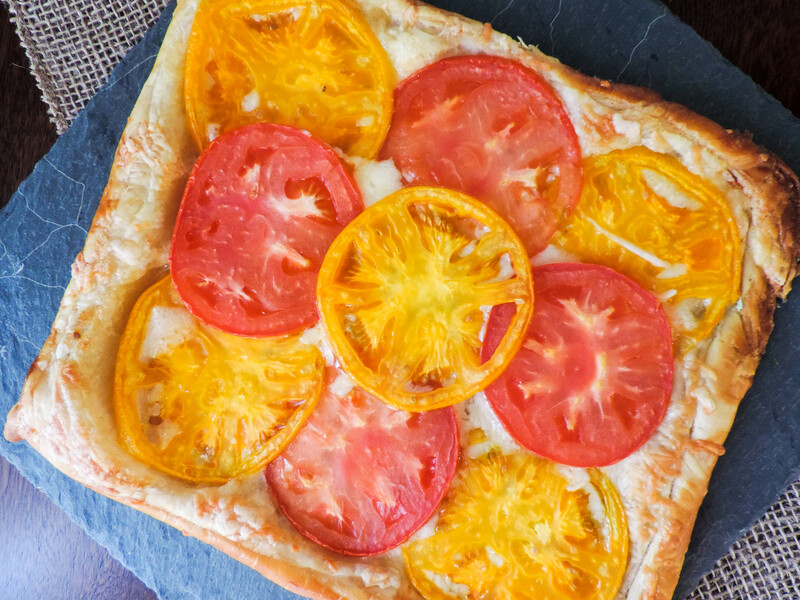 I love cheese too, so it was a bit of a no brainer to me to try my hand at a Heirloom Tomato Tart (inspired by this asparagus one I’ve previously made). 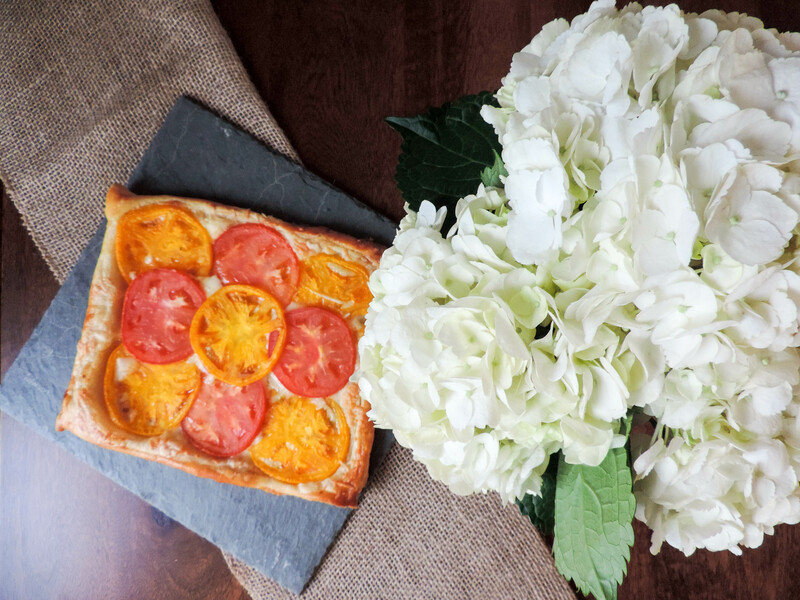 This tart is both delicious and beautiful- especially with the contrasting tomato colors- making it a crowd pleaser for appetizers. The recipe is easy and I have a feeling you’ll love it! Have you been cooking with tomatoes or any other seasonal produce recently? Would love to hear what you are making! Slice your tomato and place on a plate covered with a paper towel for about 15 minutes. This will allow some of the moisture to come out of the tomato and prevent overly runny tomatoes once you cook. Prepare a workspace with flour and roll out your puff pastry to desired square size. Score a border around the edge of the puff pastry evenly. In a small bowl, combine 1 egg with a dash of water to create an egg wash.
Brush egg wash along border of the puff pastry. Place puff pastry in oven to bake for 15 minutes. While baking, grate the cheese. Remove puff pastry from oven and add mixture of both cheeses. In desired pattern, lay tomato slices on top of the cheese. Return to oven and cook for an additional 15-20 minutes or until cheese is fully melted and pastry golden brown. Hope you are having a great Labor Day long weekend. 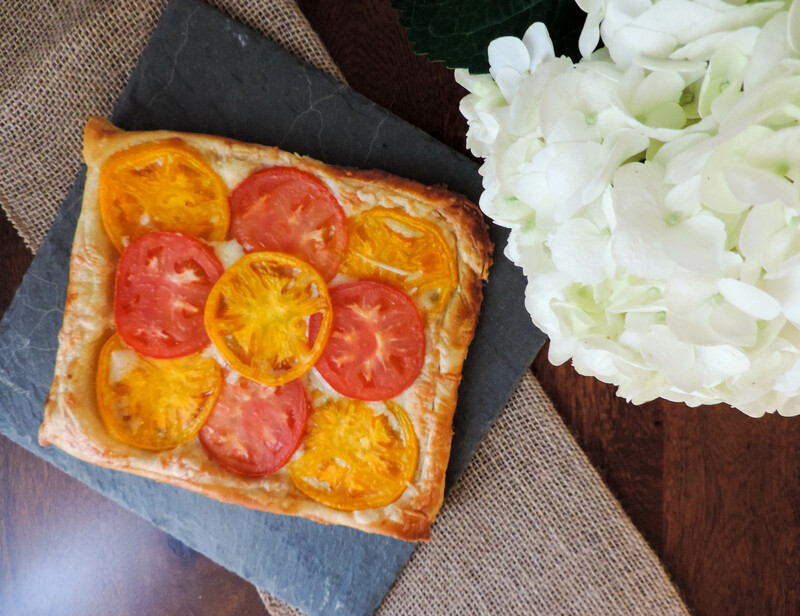 I’ve been eating tomatoes from our garden non stop, so I’ll have to make this lovely tart!! I feel you though on the constant travel this summer and into September with weddings and more. Enjoy it all. You’ll love Charleston. Poogan’s Porch and FIG were my favorites. This looks incredible!! It’s embarrassing how little cooking I’ve done this summer. Also, so so jealous you’re going to Charleston! I went last October and fell madly in love, if you like BBQ make sure you go eat at Nick’s BBQ on King’s Street..omg its unreal!! Thanks for the reco, Tess! My hubby loves BBQ so we will test that spot out! Oh asparagus and tomatoes sounds good! Let me know how that works! YUM!!!! this looks fantastic! I bet a little basil on top would be great, too! Can you please visit my blogs, it’s about an incident I had, 3 month coma and the obstacles I went through to be where I am at.